Groundhog removal is done in a variety of ways depending on the company. Live catch traps or lethal traps can be used, which go over the main hole to remove the groundhogs effectively. Groundhogs will sometimes create tunneling systems along a homes foundation, and that can be trouble. If there are multiple tunnels along the edge of your foundation, it can offset the balancing of your entire home. Call one of our professionals today for groundhog removal services. The groundhog, also known as a woodchuck, is a rodent of the family Sciuridae, belonging to the group of large ground squirrels known as marmots. It was first scientifically described by Carl Linnaeus in 1758. Groundhogs — also known as woodchucks, whistle pigs, or marmots — are stocky mammals with strong, short legs and short bushy tails. They are called whistle-pig for their tendency to emit short, high-pitched whistles. Their fur ranges from dark to light brown with very light guard hairs, making them sometimes look frosted.  Their front feet have long, curved claws used for digging burrows. Groundhogs generally weigh between five and ten pounds, and males are usually slightly larger than females. Groundhogs (Marmota monax) are closely related to squirrels. “They are giant ground squirrels is what they are,” says Richard Thorington, curator of mammals at the Smithsonian National Museum of Natural History in Washington, D.C.
Groundhogs range from eastern Alaska through most of Canada and the eastern United States, as far south as Georgia. They are, for the most part, absent west of the Great Plains, though their close relative, the prairie dog, ranges farther to the west. Groundhogs are classified as rodents and are related to animals such as mice, porcupines, squirrels, and beavers. Groundhogs are also excellent diggers with dens ranging from simple and shallow dwellings, to extensive tunnel systems twenty-five to thirty feet long, and two to five feet deep, with two entrances. Their nesting chamber is usually at the end of the main tunnel, and they also make a toilet chamber somewhere within the tunnel system, helping to keep their living space clean. Groundhogs seldom venture more than a few hundred yards from their burrows. They have a keen sense of smell and hearing, helping to keep them safe from predators. They are also fierce fighters and can hold their own against their enemies, which include humans, dogs, coyotes, foxes, bears, bobcats, mink, hawks, weasels, and owls. Groundhogs will also emit a loud whistle or shrill when startled or frightened (thus their nickname, “whistle pig”), then continue on with a “chuck chuck” type of chatter until they settle. During pre-colonial times, groundhogs lived in forested areas. Once the land was cleared for farms and towns, they moved to fields and “edge” — the border between a forest and town. They are found throughout many suburban areas where edge is common. They are very adaptable mammals. This fascinating mammal is also a true hibernator. They fatten up for the winter, gorging themselves as best as they can each fall. Once winter temperatures begin, they enter their sleeping chamber, shut down their metabolism and begin their long sleep. Groundhogs hibernate from late fall for roughly three months, then wake up when it’s still quite cold. But it turns out they have a very good reason to drag themselves out of bed. There’s evidence that male groundhogs wake up early to get a head start on reproduction. “The males come out and start to prepare for the mating season,” says Stam Zervanos, retired professor of biology at Pennsylvania State University in Reading, who’s conducted extensive research on groundhogs, which involves surveying their turf and making house-calls to female burrows as early as February. Having determined where his potential mates are, the male then returns to his burrow to sleep for another month or so until early March when it’s time to mate. Groundhogs can cause major damage to farmers and home gardeners. They love to eat vegetables and leave the soil weak in areas where they burrow, resulting in damage to farm equipment and injuries to horses and livestock. 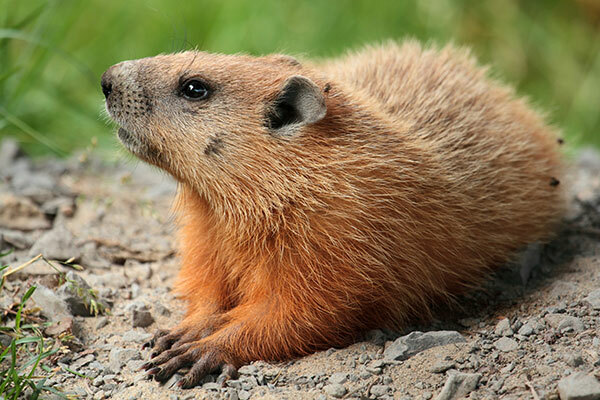 In extreme cases, groundhog burrows have even been known to damage the foundations of barns, garages, or homes. Rabies can also be a concern for people who have groundhogs on their property. They are mammals, making them susceptible to the disease. There are a few solutions available to folks who are having a problem with groundhogs. Installing a wire mesh fence can deter groundhogs from browsing your gardens and crops. You must, however, make the fence extend down into the ground at least two feet. Because groundhogs are excellent diggers, installing a simple fence from the ground up may not do the trick. You should also extend a one-foot, angled section from the top of the fence. Some groundhogs have been observed climbing short, vertical fences. Ammonia soaked rags are another good groundhog deterrent. Groundhogs will mistake the ammonia for a predator’s urine, and will steer clear of your property. Place the rags close enough to your garden that the groundhog can smell them, but not so close that the ammonia will leach into the soil around your crops. A few feet from the perimeter of your garden is a good rule of thumb. If you’re worried about the ammonia burning your lawn, you can place them on pieces of wood. If you have a cat, used kitty litter will serve the same purpose. If all else fails, you can also live trap and remove groundhogs from your property. Always check with your state wildlife agency before relocating any animals from your property. There may be laws in your area prohibiting you from doing so. Relocating groundhogs is illegal in some states, due in part to fears of spreading rabies. Grasses and forbs are the primary diet of groundhogs, making them true herbivores. Forbs are any plants other than grass with growth that dies back after flowering and seeds set. They will also eat things such as fruit, tree leaves, garden vegetables, clover, and alfalfa. As a general rule, groundhogs breed in their second season, although some have been known to breed as yearlings. They breed in March or April, and a litter of two to six young that are born about a month later. 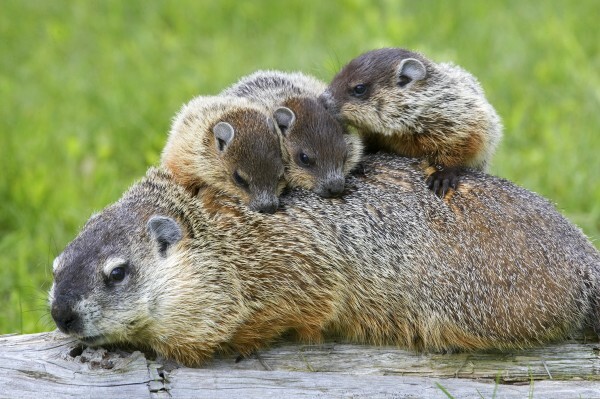 Groundhogs grow, and are weaned, at a very fast pace and will seek out their own den and range by mid-summer. They are born blind, naked, and helpless.